I want to share three of my all-time favourite pictures with you. I think they are magnificent, not only because of the exceptional technique and draughtsmanship they exhibit but also for what they represent and the significance of the event that each depicts. They are remarkable things, aren't they? Each powerful in its own right, pregnant with the drama of one of those rare occasions where history definitively changed over the course of a moment. 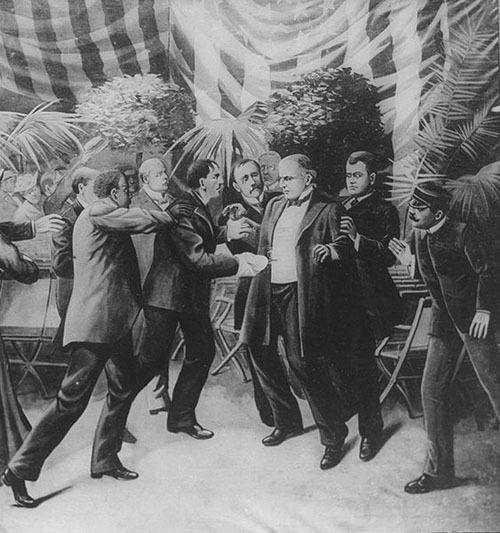 Sadly, aside from the picture of the shooting of William McKinley (by which point the United States was averaging a Presidential assassination just under every 20 years, a poor batting average by anybody's standards) which is by T. Dart-Walker, I do not know the identities of the other two artists. Such was the way of it in the days when photography was a luxurious plaything. The sharp-brained among you will, of course, realise that there's something incomplete about this series. 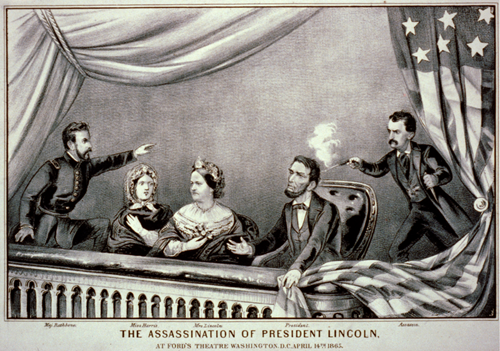 Because to the best of my knowledge, there is no such image of the fourth Presidential assassination in the United States, that of John Kennedy on 22nd November 1963. By then, celluloid had assumed its primacy over the pencil or the engraving, a position which it shows little sign of relinquishing any time soon. 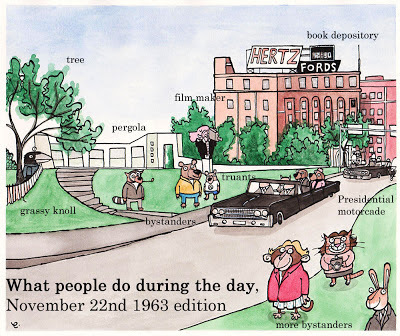 What we are left with instead, of course, is the silent 8mm cinefilm taken by Abraham Zapruder in Dallas that day. There's always a witness to history, argued the Naudet brothers, who inadvertently captured the initial aeroplane strike in New York City on 11th September 2001. 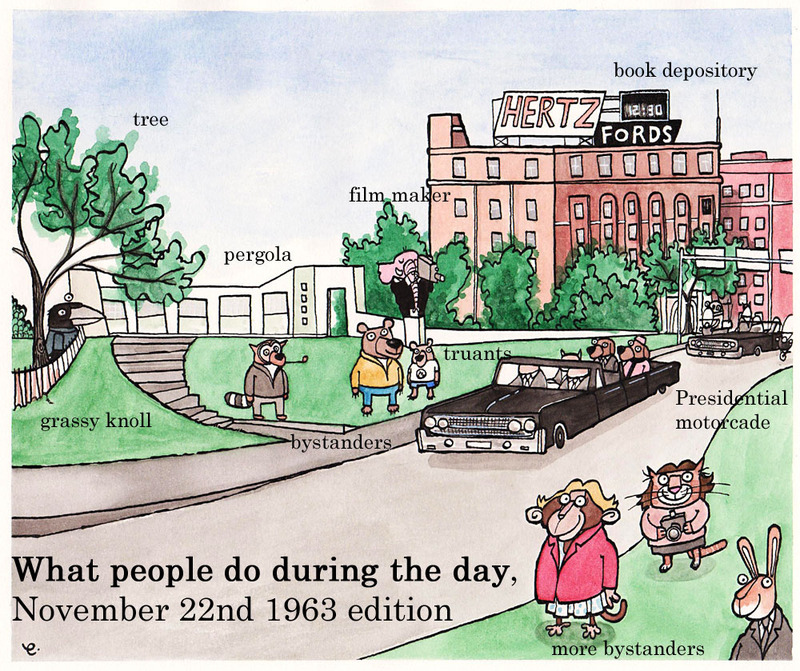 Zapruder is perhaps the most famous example of this truism. But oddly, a moving record of the event has proved so much more equivocal than any of these three artist's impressions. 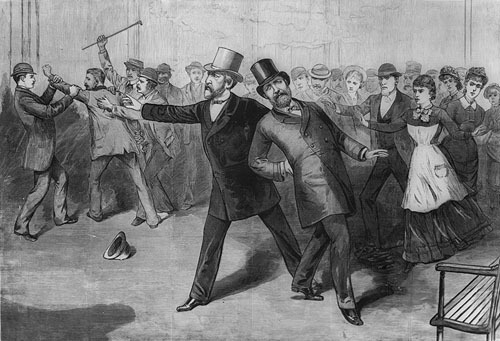 Perhaps it is by virtue of the nature of the shooting, by long-distance sniper rather than by the up-close-and-personal approach favoured by John Wilkes Booth, Charles Guiteau or Leon Czolgosz. But common sense states that the more data is available, the easier it should be to draw conclusions from it. The Zapruder film has, in the past fifty years, been used as sure proof of almost every theory, conceivable or otherwise, relating to the Kennedy assassination. It's a peculiar state of affairs. But it was more from the point of view of completism, however, than in the spirit of providing any definitive proof, that I decided that I needed to finish the set. So today I am proud to unveil the first ever artistic impression of those terrible events in Dallas half a century ago this November. Will it stand the test of time in the same way as the others? Only history can tell.